South Africa protects just under 25 areas of its 3 000 km coastline. Known as marine protected areas (MPA), they safeguard threatened marine species and important habitats. What they are, in essence, is a space in the ocean that strictly regulates human activities. Kind of like nature reserves, but in the sea. This fine balance often means compromise. For Marine Protected Areas to function optimally they need to operate as ‘no take’ zones (any removal of resources is prohibited). But because of where some of the MPAs lie only partial protection, in the form of restrictions like catch limits and seasonal closures, is possible. These restricted and sanctuary zones are difficult to manage, particularly where human resources are limited. Just what human activities are regulated, and how strictly these regulations are enforced, depends on the type of Marine Protected Area. But MPAs are not just there to regulate human activities. They also meet education, recreation, and research needs. Marine Protected Areas consider pelagic biodiversity, threatened species, the sustainability of fisheries, bycatch and the seabed. They also provide integrative data of the coastline from Port Nolloth to beyond St Lucia. These spaces are of the most beautiful natural areas in South Africa. Many of them need little by way of introduction – like Table Mountain Marine Protected Area or Tsitsikamma Marine Protected Area. But other more out of the way areas are worth discovering. 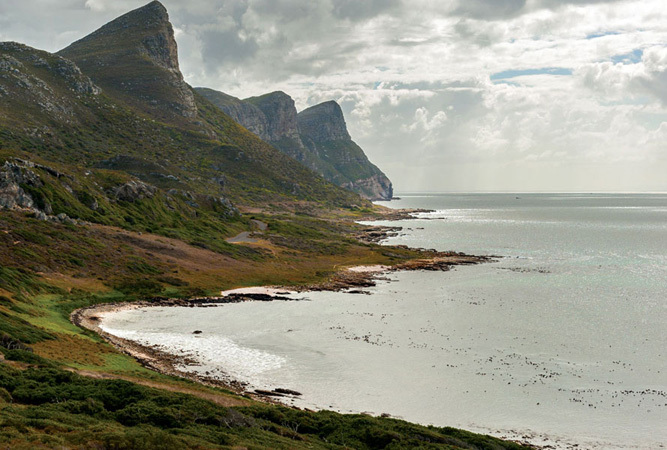 This mountainous coastline near Bettys Bay became an MPA more recently, in a bid to protect rock lobster and abalone. Extending 3 km along the coast between Jock’s Bay and Stony Point (where you’ll find a thriving African penguin colony) it also extends 2 nautical miles out to sea. Originally a no-take zone, recreational angling is allowed between a beacon at Stony Point and another to the east of Jock’s Bay (although reverting to a no-take zone is under discussion). All other fishing, jetskis and power boats are illegal, although you can scuba dive and free dive with a permit. The coastline’s rocky headlands, wave-cut platforms, long sandy beaches, kelp forests and sub-tidal reefs make it a diverse waterland. It forms part of the core zone of the UNESCO Kogelberg Biosphere Reserve. 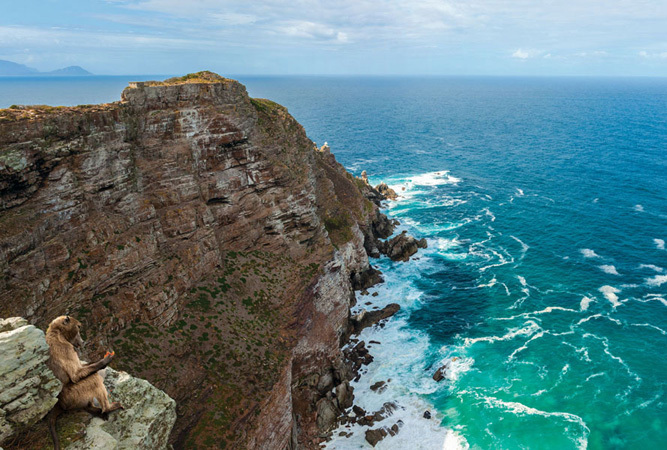 Proclaimed in 1985 this MPA lies alongside De Hoop Nature Reserve, covering an area of 253 square km that include the coastline between Stilbaai Point and Ryspunt, and extend three nautical miles offshore. 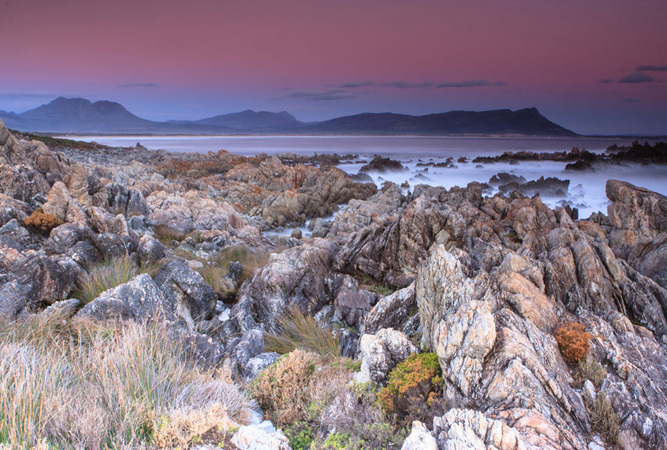 The MPA protects an intertidal system of large, eroding, soft sandstone and limestone platforms found nowhere else in the country, and protects populations of reef fish and overfished migrants like galjoen and red steenbras. The natural beauty of De Hoop features: mobile sand dunes, Khoi-San shell middens and a large shallow sheltered bay – the main breeding ground for hundreds of southern right whales; it is a critical space for the African black oystercatcher, white-fronted plovers and terns, healthy populations of dolphin, and the great white shark (that feeds on the afterbirth of the whales), whilst a small colony of African penguins breed in the isolated eastern section. Hire a local guide or walk the Whale Trail. 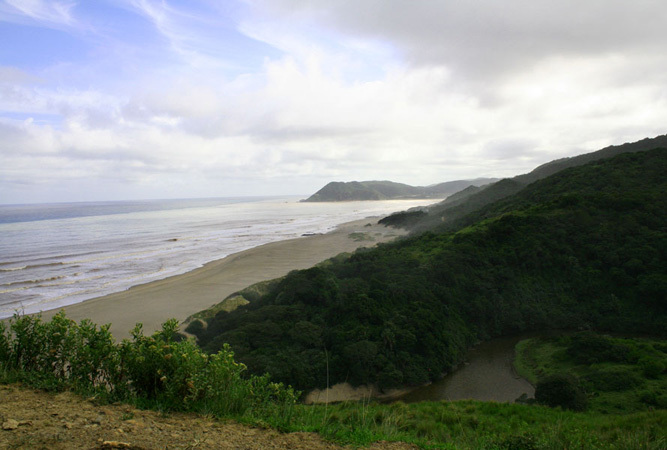 Hluleka MPA lies adjacent to the Hluleka Nature Reserve on the Eastern Cape’s Wild Coast, incorporating the coastline of the reserve. Its shoreline is only 4 km long but it extends 6 nautical miles out to sea and protects phenomenal rocky shores, sandy beaches and a river mouth. Its smallness (it is both small and narrow)is limiting as far as protecting biodiversity goes, but without the support of neighbouring communities (who fish these seas for their food) it is highly unlikely to increase. As if to make up for this, the entire MPA is a no-take zone. It is rich with lagoons, beaches, extraordinary views and zebra and wildebeest that feed on the lawn right outside your wooden chalet atop the beachside cliffs. 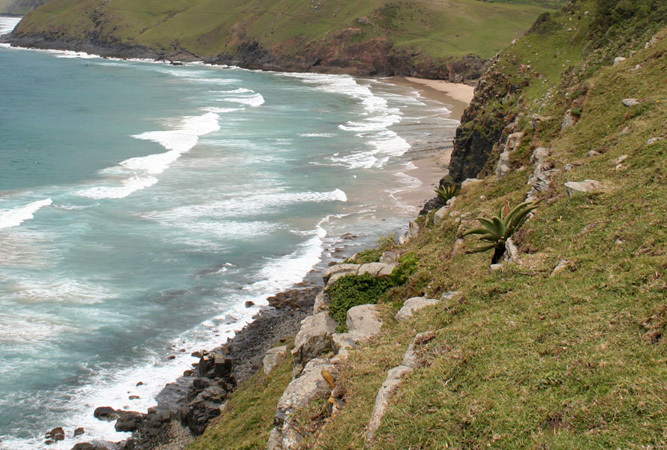 The Wild Coast is protected by more than one MPA – there is one at Dwesa-Cwebe, and another in Pondoland. iSimangaliso Wetland Park is part of Africa’s first trans-frontier marine conservation area protecting 300 km of unbroken coastline from the border with Mozambique to Cape Vidal. 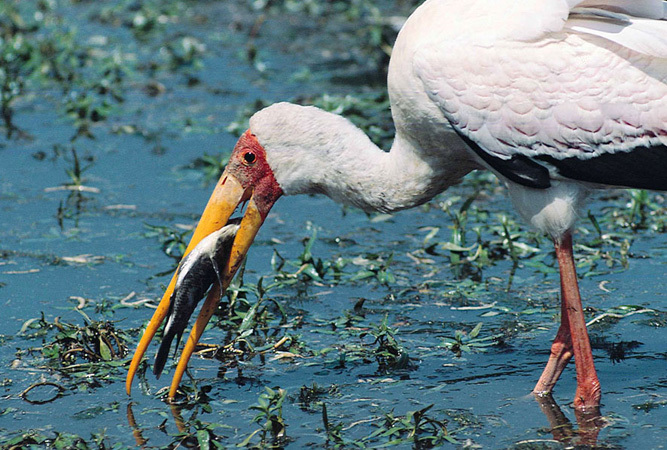 The Isimangaliso MPA (the collective name for the combined St Lucia and Maputolaland MPAs) is the largest in the country, stretching alongside the Wetland park for 145 km. This coastline is both nationally and internationally significant for its turtle nesting beaches, a 50 years running, world-renowned turtle-monitoring programme, and coral reefs. The three nautical offshore miles of the MPA also support the endangered coelacanth and subtidal rocky reefs. This is a place of superlative scenic beauty. Another of the country’s largest MPAs lies on the northern Wild Coast, a beautiful, largely rural and undeveloped coastline. The 90 km MPA between Port St Johns and the Mzamba River, just south of the Wild Coast Sun, was proclaimed to protect and rebuild vulnerable and depleted reef-fish stocks. This coastline is alive with rivers, streams, waterfalls and tributaries, little infrastructure (no national road), and Mkambati Nature Reserve – one of the most scenically beautiful reserves in the country. Some of the densest concentrations of large marine mammals in the world are in evidence along this coastline. Humpback whales and dolphins, in particular, are seen in great numbers. Rocky shores and sandy beaches with large subtidal reefs extend for miles. Stay in Mkhambathi or walk the Pondo-Explore hiking trail. 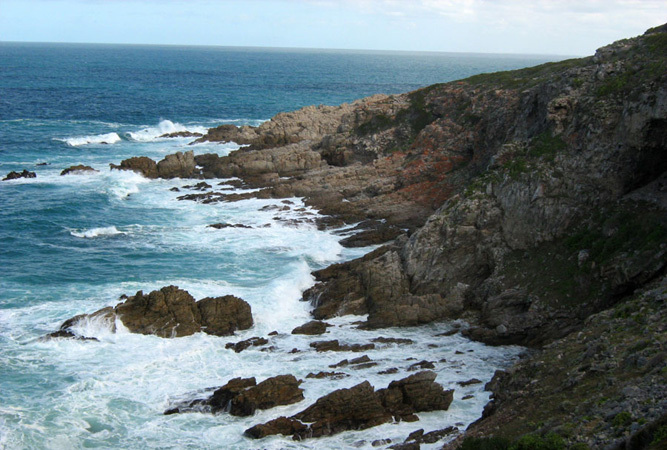 This marine protected area lies west of Port Elizabeth between Schoenmakerskop and Bushy Park. Its 7 km rocky and sandy shoreline, and an extension of one nautical mile offshore to include subtidal rocky reefs and sandy benthos (organisms on or near the seabed), is a no-take zone, although abalone poaching is a problem in the area (MPA staff are not mandated to control diving activities from boats). 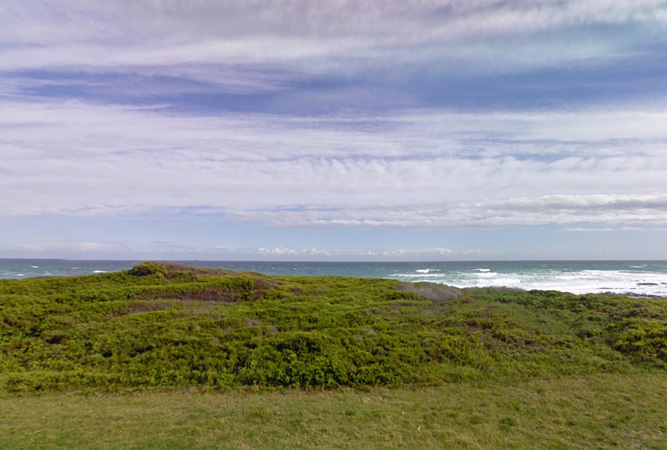 The Sardinia Bay Reserve and Sylvic Nature Reserve lie alongside. The dunes at Sardinia Bay shift about 5 metres a year on this coastline, popular for snorkelling, scuba-diving and some of the best beach walking on the coast.